TCP-Z is a very useful memory manipulation utility that patch and change TCP/IP simultaneous concurrent half-open incomplete outbound/outgoing connection attempt limit in Windows operating system dynamically. Unlike most TCP/IP half-open limit patchers available on the Internet, TCP-Z does not actually modify and patch the actual tcpip.sys system file. Instead, TCP-Z directly access the kernel memory to set the new value as number of half open connection limit allowed. TCP-Z has some similarity to CrackTcpip.sys (now renamed UnlimitedTcpip.sys) which uses a memory resident driver to modify the connection limit. TCP-Z, developed by a Chinese named deepxw, has the full project name of TCP-Z Network Monitor, and is also known as TCP Half Open Connection Limited Patcher, is far more superior than and contains all features of most other TCP/IP half-open connection limit patchers such as Event ID 4226 Patcher, EvID4226 Fix, TCP/IP Patch, VistaTCPPatch, Half-Open Limit Fix and etc. It supports patching of tcpip.sys on all versions and editions of 32-bit (x86) and 64-bit (x64) Windows operating system that implements the limit on outgoing incomplete connection attempts, such as Windows XP SP2/SP3, Windows Server 2003 RTM/SP1/SP2, Windows Server 2008 RTM/SP2, Windows Vista RTM/SP1/SP2 and Windows 7 (in actual, Windows Server OS will also has the connection limit parameter, however it’s ignored and not implemented in server). Safe And Easy: Modifies tcpip.sys in memory. The changes take effect immediately; do not need to restart the computer. Wide Compatibility: It searches limit offset through signature, no longer focused on the MS upgrade and update. So, the same driver patch may be used for all future updated version of tcpip.sys, and currently TCP-Z also supports all version of Windows which has the half-open connection limit. Professional Chart: TCP-Z shows number of established connection, half open connection, create depth, download/upload speed in real-time. And software will show the number of warnings events (Event ID 4226) in per-minute, which will indicates that TCP half open connection is overloaded. TCP-Z memory hack works because Windows only loads tcpip.sys into memory on system startup. After that, OS reads the number of incomplete half-open TCP connection limit from the memory, and not from hard disk. TCP-Z takes advantage of this inner working to modify just the TCP connection limit value in memory which can take effect immediately. Manual Patching: Run GUI application tcpz.exe (for 32bit OS) or tcpz64.exe (for 64bit OS) to modify connection limit value. No memory resident driver or program is been loaded or used, so Windows Vista user no longer require to set the system to test signing mode. All change in limit takes effect instantly without having to restart. The disadvantage is that, the patch has to be done every reboot. This may be an advantage to some, who just want to increase the connection limit when runnning BT torrent or ED2K downloading, or when watching P2P TV to optimize torrent and P2P traffic. Note: You can close and exit the TCP-Z program after patching. The new limit will effective until you reboot or shutdown the PC. 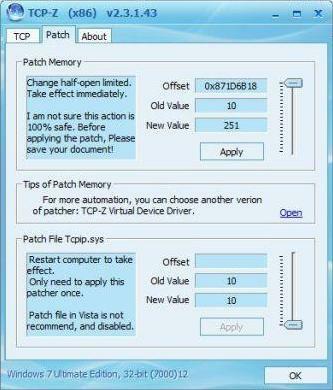 Automatic Patching with TCP-Z Virtual Device: Install TCP-Z Virtual Device Driver. A new device named TCP Half Open Limited Patcher (TCP-Z) will be added to the system, configurable through Device Manager. The driver will modify the limited value automatically without human intervention. Use Device Manager property page to customize the maximum value. The driver is digitally signed with a test certificate, so that it can be accepted by most 32-bit OS, and can be loaded by 64-bit OS in TestSigning mode, and do not require pressing of F8 at boot menu to select ‘Disable Digital Signature Enforcement’ or using ReadyDriver Plus to load. For Windows XP, TCP-Z also supports patching the physical tcpip.sys file on the hard disk drive. Restart the computer when done. Above commands just need to run once. However, a “Test Mode” watermark may be placed on desktop, which can be removed. You may be wondering why in Windows Vista and Windows 7, the maximum value of TCP connection limit can be set is only 255 or 251. This is because the tcpip.sys of Windows Vista and Windows 7 has only 1 byte for the limit, so that maximum value is 0xFF (255). In Windows XP, up to 4 bytes can be configured as the limit, so the maximum connection limit can achieve is 0xFFFFFFFF. Go to Device Manager to modify and set the parameter value of intended TCP/IP half open connection attempt limit. Note: Since Windows Vista and Windows Server 2008 SP2, there is no more restriction (now unlimited) concurrent half open TCP/IP connection limit, although the limit remains active at Windows XP.